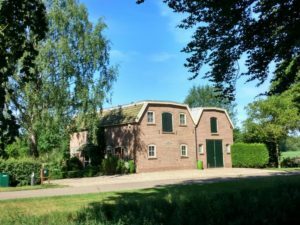 In 2006 a part of the former mill “De Voorzorg” (The Precaution) has been transformed into a luxury holiday cottage. The cottage is attached to the main house and is completely self-contained. It is situated on the ground floor and is suitable for up to 3 people. Extra wide doors have been installed which means the apartment is also suitable for people with a physical handicap. The cottage has a floor space of approximately 48 m². “De Voorzorg” borders on 100 ha of country estate and is surrounded by farmland. The area is very well suited for walking and cycling. Prices range from 295 to 495 euro per week. Towels, bed linen and electric are included. There is a 45 euro cleaning cost upon leaving. Friday is the arrival and departure day. Pets are allowed, however some extra cleaning costs will be charged. In the cottage smoking is prohibited.